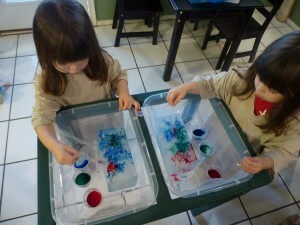 We recently spent a day doing science experiments about melting. 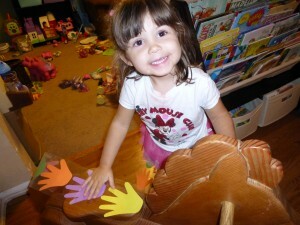 It fit well with our snowmen activities we did earlier. We did activities melting ice, candles, chocolate chips, and crayon bits. This day was inspired by activities in Science is Simple by Peggy Ashbrook and The Complete Daily Curriculum by Pam Schiller and Pat Phipps. 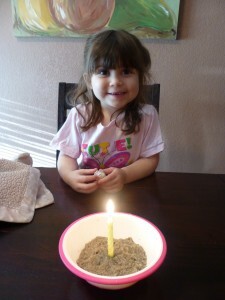 Of course to kick off our look at melting, we started by lighting small candles planted in bowls of sand to catch the wax. The girls loved this and it looked really cool! First freeze blocks of ice. I used old 1/2 gallon cardboard drink packages such as an orange juice container. After they were frozen, when it was time, tear off the cardboard sides. Put coarse salt, such as Kosher salt, onto the block of ice. We just sprinkled it over the top before lunch time and then came back to our blocks of ice after lunch. This gave the salt time to melt little tunnels into the ice. Drop colored water onto the block of ice. We used plastic pipettes (an eye dropper would work great too) and liquid watercolor paint. 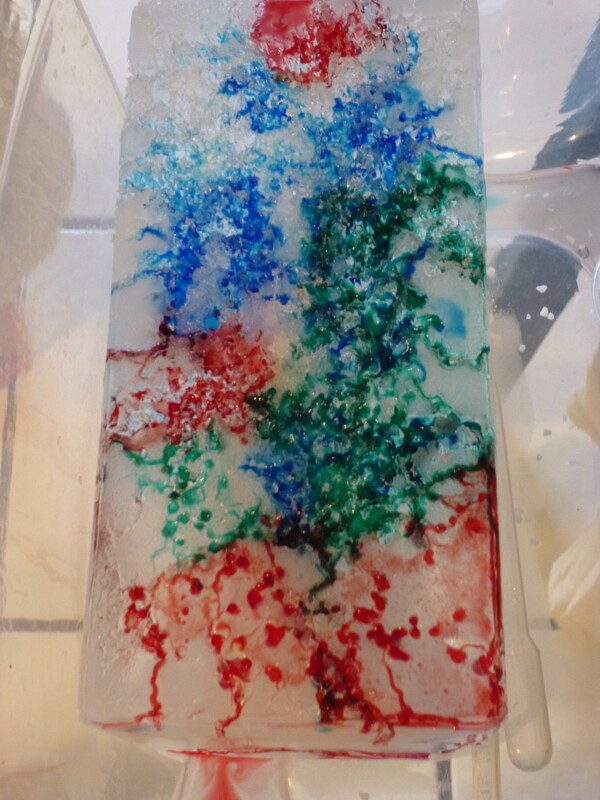 The color drizzled through the tunnels made by the salt creating really cool designs and showing how the salt had melted down the ice. To show that things other than ice and candles can melt, we looked at how chocolate melts. I gave each girl a chocolate chip to hold in their hands. Of course this works best if you give them an extra chocolate chip to eat. Then they held their chip tight in their hands while doing jumping jacks, dancing, and marching around the house. Afterwards we opened our hands to see how the chocolate chip had melted. Finally, we made our own new rainbow crayons to look at one more example of how things melt into a liquid and then harden into a solid. 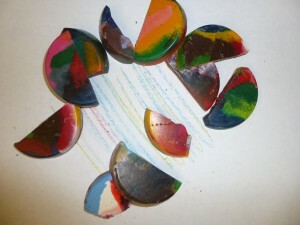 Gather up your broken crayon bits and take the wrappers off. Mix up the pieces and put them in a heavily greased muffin tin. Bake at 250 degrees for about 10-12 minutes. Take out and let cool. Then enjoy coloring! 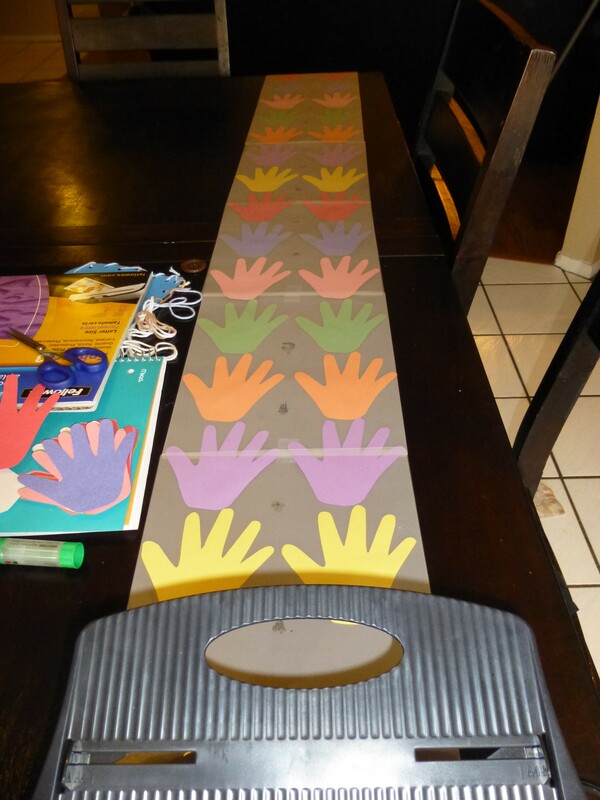 While talking about our bodies this past week, we did this fun math and science activity, Measuring Hands. We traced the girls hands and used them to make measuring tapes. 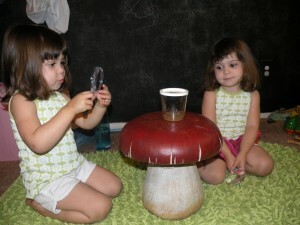 The goal was to get the girls to start understand concepts such as units of measurements and size comparisons by using something tangible that they could understand like their own hand. I got the idea from activities in the book Science is Simple. 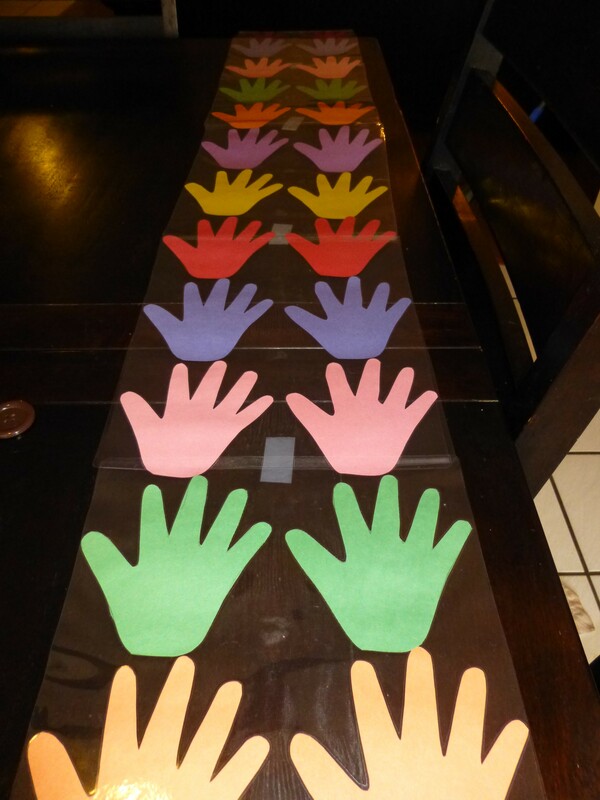 Ahead of time I traced the girls hands and then used those as templates to make multiple hands out of colored construction paper. I knew I wanted to laminate just the hands to create a strip. It was a little tricky but I took the 8 1/2 x 11 size laminating pouches and trimmed off the top so that I could connect multiple sheets together. I taped the sheets together with just a little bit of tape in the middle so that it wouldn’t show up in the strips too much. And I overlapped the sheets by about 1/2 cm. To help keep the whole thing together I used a clear glue stick and glued the hands to the bottom laminating sheet. And sometimes I even used a little glue to keep the top sheets in place. We made the strips long enough to measure their height and larger items around the house. I recommend also making a smaller strip of about 3 hands to introduce the concept and measure smaller items like their feet. Zoe measuring the seat of her rocking horse. This is one time a smaller strip would definitely be useful. 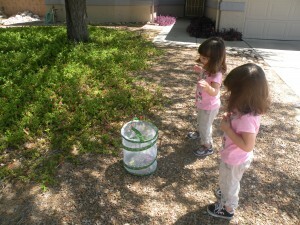 We set our butterflies free just the other day! The girls and I were all a little sad to see them go. I was also a little surprised at how hard it was to get them to go free–they just wouldn’t fly out of their home at first. 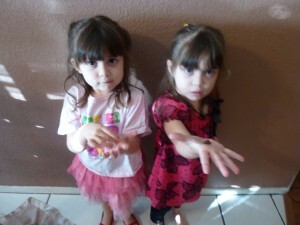 Here is a picture of the girls saying good-bye. Overall, this has been a really cool project. 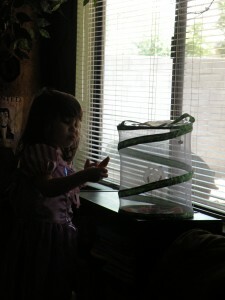 The first morning most of the butterflies had hatched from their chrysalis (4 of the 5), the girls stood there talking to them all morning. They introduced themselves and would sing songs to the butter flies. It was so cute! They loved just watching them, which really helped two rambunctious little girls practice being calm and still and observant. 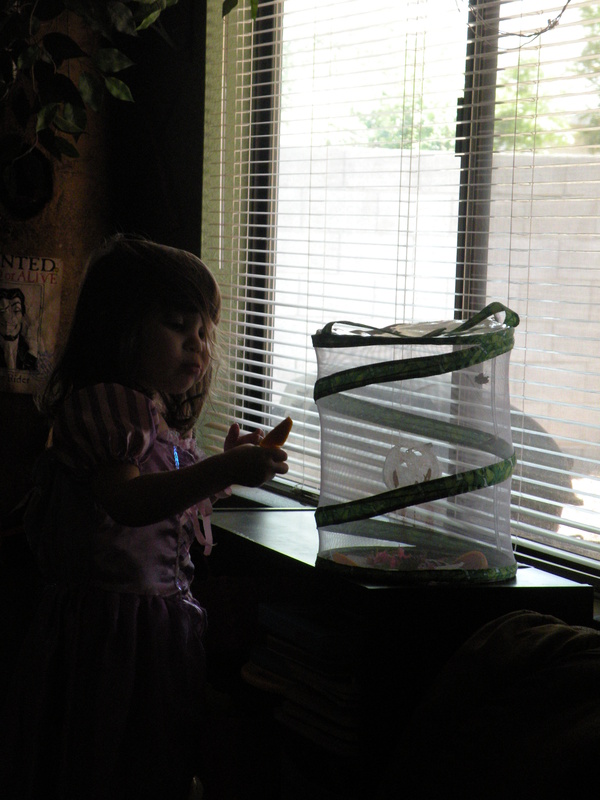 In case you missed it in the Live Caterpillar Fun post, our butterflies first arrived as tiny caterpillars which we ordered through Insect Lore. 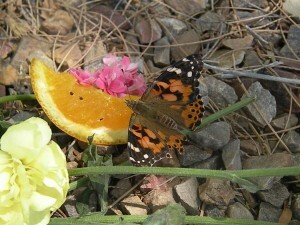 They came in a cup with food and a butterfly house as well as directions for feeding and caring for them at each stage. 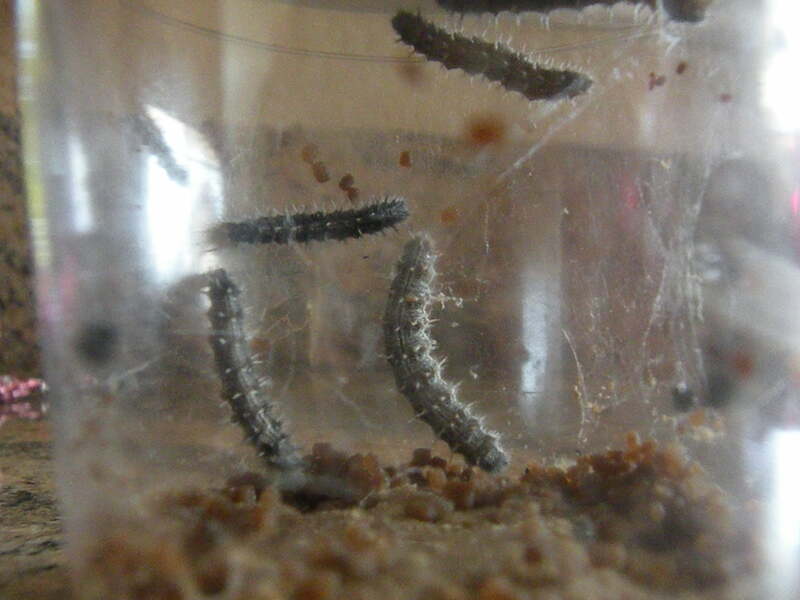 Five caterpillars were included in the kit; however, one hatched with crumbled wings and didn’t survive very long, which caused the girls to learn even more about the circle of life than originally planned. In addition to the books we checked out from the library, we really enjoyed Science is Simple. It is the book that gave us the idea to order butterflies and included suggestions for discussion and activities. With the arrival of our caterpillars, we of course kicked off a caterpillar theme that included art, science, letters, and numbers. Unfortunately the girls and I all became really sick so things didn’t go quite as planned and it’s taken us a lot longer to do what I had planned but here are our caterpillar activities. 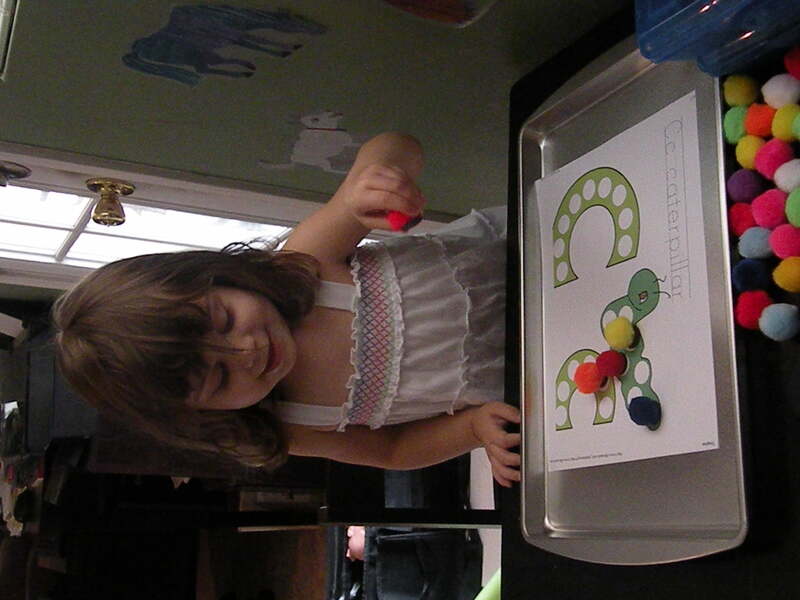 I decided to save The Very Hungry Caterpillar activities for another post. And, in case you missed it, you can read all about our live caterpillars and some of the fun we have had with them here. I just cut up cardboard egg cartons to make the caterpillar bodies and then the girls painted them. 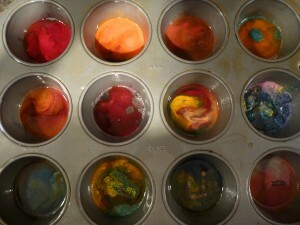 I recommend using darker colors since the colors all faded a lot after it dried. For the antennas I poked holes in the head and then threaded through a shortened pipe cleaner. Then we glued on the googly eyes (because everything is more fun with googly eyes) and the pom pom nose (which I am not a fan of but the girls really wanted to add). To practice our counting I made this caterpillar leaf game. While it could easily be mounted to a file folder, I decided to keep the leaves separate so that the girls could focus on one card at a time. I would put down a leaf and then the girls would add the correct number of “caterpillars,” which were really fuzzy pipe cleaners cut down to about an inch in size. If you want to make the game a little more difficult and practice some fine motor skills, kiddos can add the caterpillars to the leaf using tweezers. 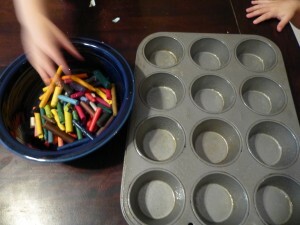 We tried this a few times but then the girls’ focus definitely moved from counting to playing with tweezers. I’ve been debating getting the dot markers since I’ve seen a lot of templates for them, but I was reluctant to get another craft supply when we have so many. 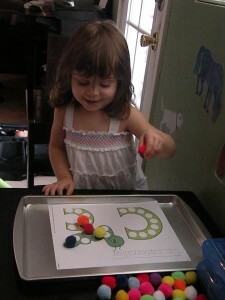 Then I decide to make our own reusable ones using cheap cookie sheets, pom poms, and magnets. I used magnetic adhesive dots, similar to these. Even though they had adhesive on them, I still needed to glue the puff balls to the magnets with the low-temp glue gun otherwise they came apart while we were playing. 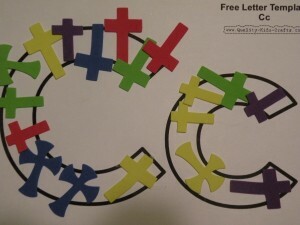 Then for this theme we used a letter C and caterpillar page I found from DLTK here. The girls loved it! 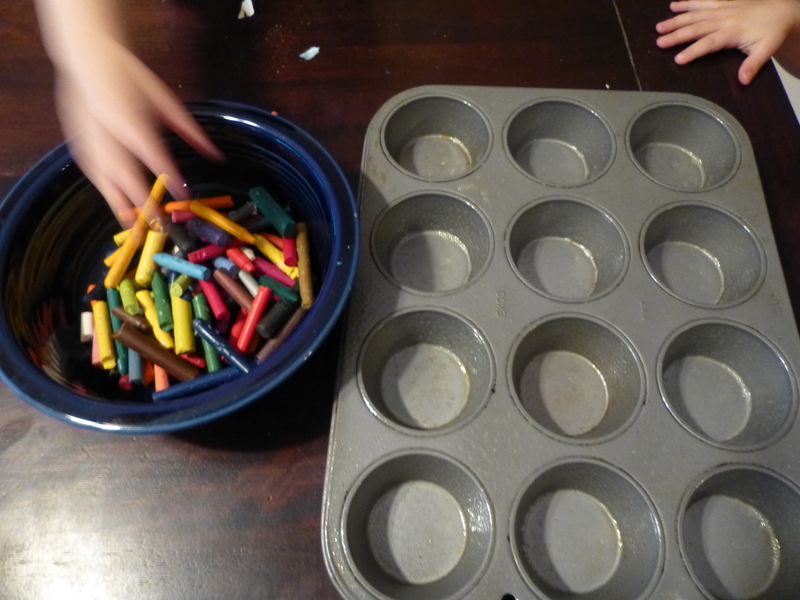 I wondered if it would be worth the effort since it seems a pretty quick activity, but as soon as they filled in the sheet they wanted to take all the balls off and go again. 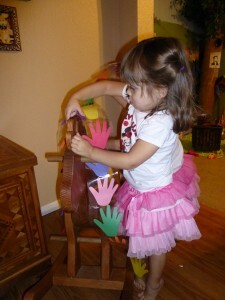 It is the perfect toddler activity! They really enjoyed picking out which color to use and filling in every circle on the page. We will definitely be doing this with other pages! Since we were talking about caterpillars, we also focused on the letter C. One of our activities was filling our C template. In my Easter egg post I mentioned how we were going to fill in one for each letter. For C we used fun foam crosses we had from Easter, but cotton balls would also work well. 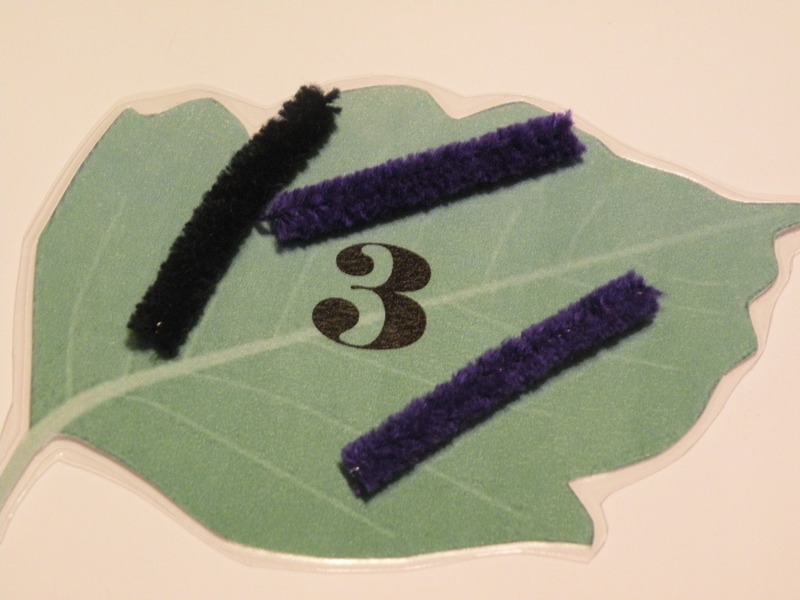 We also did some other C pages–the girls favorite was the pasting the numbers in the shape of the C.
Obviously just having the caterpillars and watching their transformation is a great science activity for the kids. 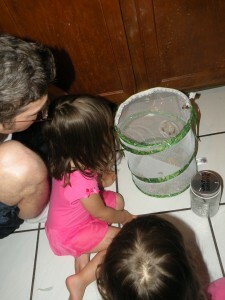 The girls have been fascinated with them as they have moved through the different stages. One of the other things we did was practice being caterpillars by wiggling on the floor. We then bundled under blankets to be in our pupa and then burst out as butterflies. They had a blast! We also have read a lot of caterpillar books. I think that with little kids it can be easy to shy away from non-fiction books because you worry they won’t understand or won’t be interested, but really this is a great time to introduce to little ones how much they can learn from reading. I just did a quick search with our library for books on caterpillars and butterflies and we found some great ones. 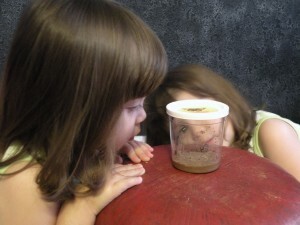 Last week our caterpillars arrived and the girls have loved watching them! Our newest friends have been moving and changing so much that we check on them multiple times each day. While the girls love the caterpillars, I love how excited they are about science as they are introduced to so many new concepts, such as the life cycle, investigating, observing and recording, magnification, nutrition. They are also learning big ideas like respect for all life and that change can be a good thing. The idea to order caterpillars as well as many of the activities we are doing actually and scientific discussions come from the book Science is Simple. Unlike other parts of the country that are overwhelming with caterpillars, we haven’t had such luck so I ordered ours online. We had a very positive experience with Insect Lore who sells caterpillar/butterfly kits as well as all kinds of other fun insects. Our kit included five live caterpillars in a cup with food and air holes as well as a butterfly enclosure they will move to once in chrysalis form. If you don’t want to go the quick and easy route, you can capture caterpillars on your own or even capture butterflies and wait for them to lay eggs. Just be sure to provide a clean, safe enclosure with appropriate food available. 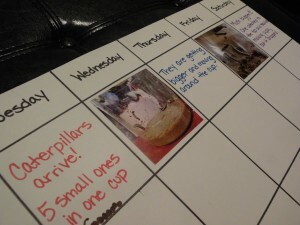 To keep track of the transformation from caterpillar to butterfly I made us a giant calendar chart. I wanted to have the girls chart the change but knew it would be hard to make it meaningful to them. I decided to go with a calendar format with lots of pictures so that they could visual see the progression of days and the changes with our buggie friends. On the days we don’t take pictures we write a few note s of what we have noticed. To make sure we had enough space, I made the calendar with five weeks on it (it takes 7-10 to make a cocoon, which they are in for 7-10 days, and then they become butterflies). I also didn’t include the dates because I didn’t want it to become too confusing, especially with the change in months at the end. We also took “notes” on the caterpillars. The girls have little spiral-bound notebooks where we made notes of what we observed. We drew a cup on the page and then Mia and Zoe drew caterpillars inside the cup like they saw th em. 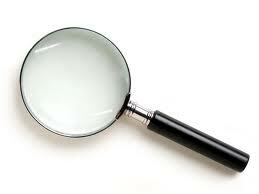 They also made notes (scribbles) of what they saw. It was great for early writing and science skills. The perfect springtime activity, our caterpillars and eventually butterflies have inspired all kinds of fun with our latest theme. 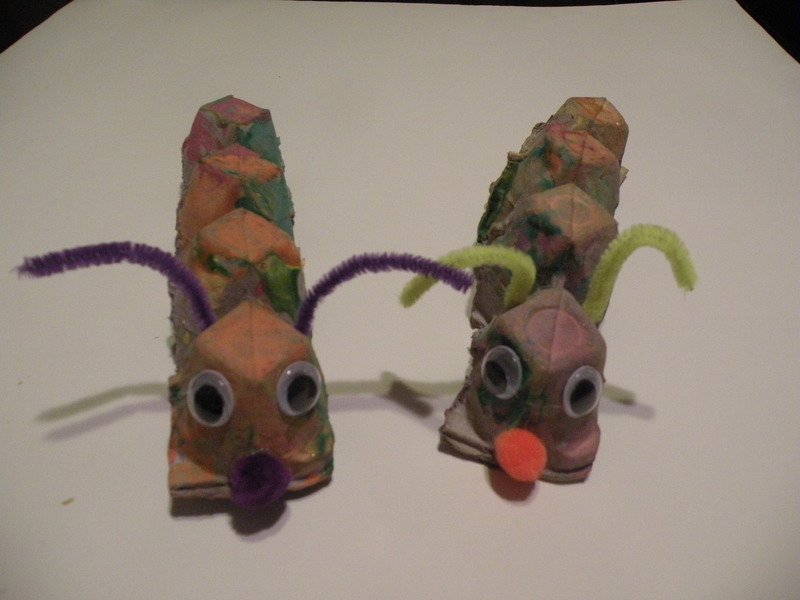 I will be posting our caterpillar activities soon!